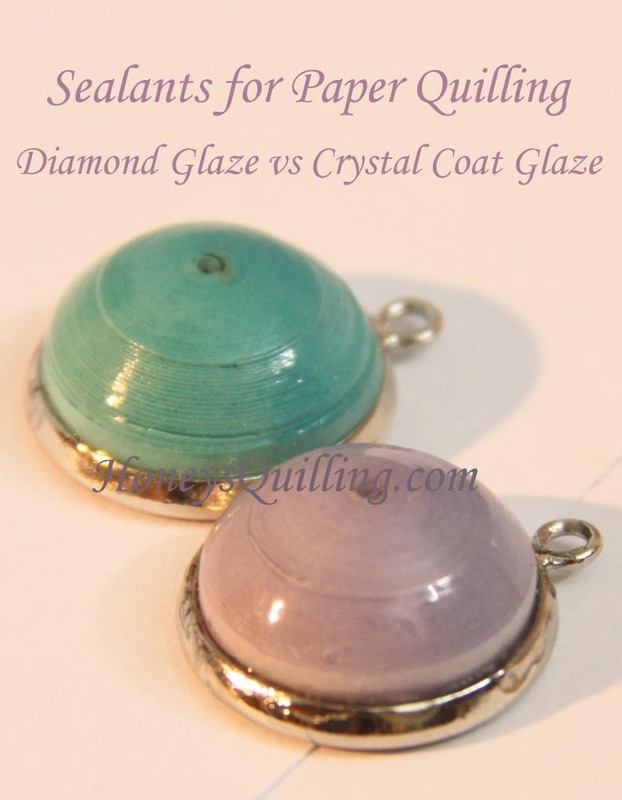 One of my goals is to thoroughly test as many sealants, topcoats, and glazes for paper quilled jewelry as I can, and to give thorough reviews, descriptions, and tips for them each. I have been using Diamond Glaze for about a year and it has become one of my favorite products to use on my quilled earrings and pendants. I have mentioned it in many posts, but finally here is a post with a full Diamond Glaze review! First of all, what is Diamond Glaze? Here is some info directly from the official website for Diamond Glaze. View the whole page here, and view the FAQ here. 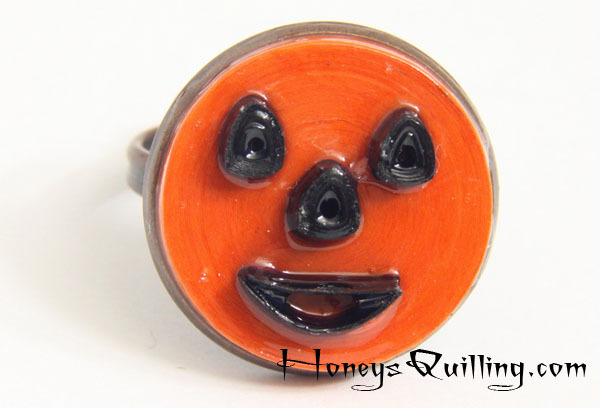 [box type=”info”] So, what is Diamond Glaze? Diamond Glaze is a water based dimensional glaze that dries to a clear glass-like finish. But it is also a super strong adhesive that bonds to glass, metal, paper and plastic. Unlike other clear adhesives, Diamond Glaze can be mixed with dye-based inks, watercolors and pearlescent pigments.This creates an infinite number of color possibilities that can be applied to a wide variety of materials. [/box] Below is my official star review and then you will find Pros and Cons and some photos of times that I have used Diamond Glaze as well as some descriptions, tips, tricks, and links to other posts that talk about Diamond Glaze and some fun tutorials as well. These scores are representative of my own personal experience with using Diamond Glaze. Overall I love using Diamond Glaze. My favorite thing about it is that it has a super hard finish. I haven’t found any other easy-to-use glaze or topcoat that has as hard of a finish as Diamond Glaze does. 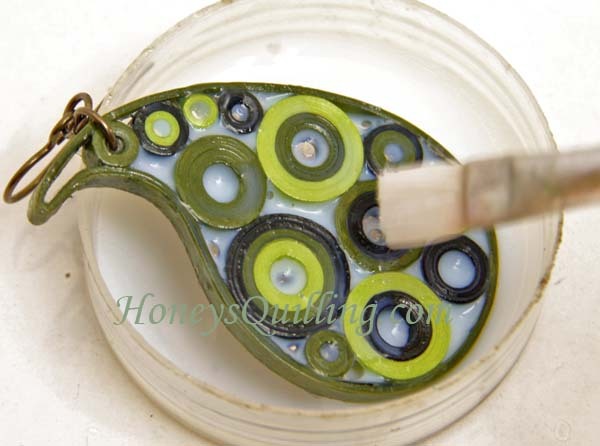 It is also an adhesive, so you can use it to glue your quilling into pendant and ring trays. I don’t know of any product that does both things perfectly. That is why my usual method involves using a liquid sealer as a base coat which soaks into the paper and makes it quite stiff. When that dries I add a glaze or topcoat for extra protection. A sealer by itself won’t last and won’t be very water resistant, and a glaze by itself won’t make the piece as stable as possible. That is why I give Diamond Glaze only 2 stars for “soak into paper to make it stiff”. It is possible to add a bit of water to Diamond Glaze to make it more runny, but it still does not totally soak into paper the way a real sealer does. However, I have many times used Diamond Glaze on paper jewelry by itself, and because it has a very hard finish, it does a pretty good job of making the final product sturdy. If I had to choose only ONE product to use I would currently choose Diamond Glaze. I hope that you found this Diamond Glaze review helpful. Let me know if you have any questions about Diamond Glaze and I’ll do my best to answer! I have many more products to review, so stay tuned! Great post, as usual, Honey. I have played around with Diamond Glaze also. I really love it for some projects but can’t seem to get it the right consistency if I mix it with water. Do you have a ratio you use? I think I’m adding too much so I try again and then it’s not enough. Any tips?